The Simpli5 aligner system involves wearing removable, clear aligners for a set period of time. The aligners will be made from digital images and impressions of the patient’s mouth and are custom-made for each patient’s specifications. Each patient receives 5 aligners (or 10 if they are having treatment on their upper and lower teeth), which they must wear for a set period of time before replacing it with the next one in the series. Each aligner is slightly different so that it fits the mouth as the teeth move. The aligners work by encouraging the teeth to move in the desired direction. The aligners are shaped differently, meaning that the teeth are encouraged to move gradually into the correct position. Each aligner must be worn for between 3 and 4 weeks and then replaced with the next aligner in the series. Simpli5 in Scotland is a simple yet advanced treatment. Simpli5 braces are very light and discreet and they can produce a straight, attractive looking smile in a matter of weeks. The braces have been designed to be as comfortable as possible and they are removable, meaning that the patient can eat and drink what they want; removable braces are also better for oral hygiene. The Simpli5 system is a fast, effective treatment for people with minor orthodontic problems, which affect their front teeth. 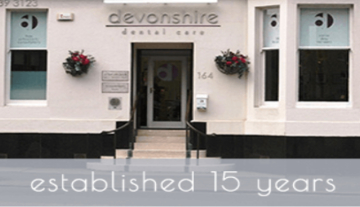 During the initial consultation here at Devonshire Dental Care in Glasgow, the dentist will talk to the patient about the treatment and examine their mouth to ensure that they are a suitable candidate for the treatment. If the patient decides to go ahead with the treatment, the dentist will create a mould of the patient’s teeth and take photographs of their mouth. The moulds and photographs will then be used to produce 3D images, which will be used to create the aligners. The treatment plan will be based on the desired results and the individual’s orthodontic problems. The aligners will be manufactured and sent back to the dentist, and the patient can then get going with their treatment. The treatment works in a similar way to the Invisalign system, with the patient wearing a series of 5 aligners that cause the teeth to move into the correct position. Treatment time is very short with Simpli5 aligners. Most patients find treatment is complete within 20 weeks, and more minor cases may take even less time. Why should I choose Simpli5? Simpli5 aligners are a very discreet treatment, which is beneficial for those who are worried about the physical appearance of braces. The treatment works quickly and can be used to correct minor orthodontic problems. The aligners are also removable, meaning you can take them out to drink and eat and also to clean your teeth. This means you can clean your teeth and gums more thoroughly and this will help to reduce oral health problems, which can be common in people with fixed braces (this is because bacteria and food particles can collect around the brackets and bands). The treatment is not suitable for everyone: the aligners are focused on the front teeth and have been developed to treat minor orthodontic problems, including minor malocclusion and minor spacing between the front teeth. The treatment may also be suitable for people who have already had extensive orthodontic treatment to make small adjustments and improvements. If you have major orthodontic problems or problems that affect the back teeth, you may be advised to choose an alternative treatment. Treatment is usually quite a lot cheaper than other invisible aligner treatments but you should consult your dentist about the cost before you agree to go ahead with the treatment. The price of this treatment starts from £1250.00. The aligners are made of plastic and designed to fit your mouth perfectly so they should not be painful at all. The treatment is designed to exert gentle force so you should not experience pain while the teeth are being moved. There are no wires or bands involved so you will not need to attend appointments to have your brace adjusted, which can otherwise be very painful for some patients so this is a definite advantage. Will I be able to eat with my aligners? The aligners are removable so you can take them out when you are eating or drinking. If you want to know more about the Simpli5 treatment system, give us a call at Devonshire House Dental Practice in Glasgow and book a consultation. During the consultation we can answer any questions you have and examine your mouth to see if the treatment is appropriate. If you are not a suitable candidate for this treatment, we can discuss other options with you.